In the last part of this series we'll write a real program in assembly language. We'll implement the Caesar cipher from Rosetta Code. This is a very simple cipher where the key indicates how much to rotate the alphabet by. So with a key of 2, ABC XYZ would be encoded as CDE ZAB. The solution should handle both encoding and decoding; decoding simply needs a rotation by the key in the opposite direction. This appears quite simple at first. Take each letter's code, add the key and return the new letter, accounting for wrap around at Z. However, this assumes that letters are coded in a contiguous manner, as they are in ASCII. The System/360 uses EBCDIC, and if you look at the code chart on Wikipedia you'll see that A, B, C, ... I are contiguous, but there's then a gap of 7 characters before J, K, ... R, then another gap and so on. Now you could account for this but it would be very fiddly in assembler. Instead, let's try another way. What if we transformed A, B, C into offsets 0, 1, 2. Next, add the key and use that as an index into a table of letters repeated to allow wrap around. This should work, but how to implement it? The first step is turning A, B, C into 0, 1, 2. There's a useful opcode called TR that can help us here. This will take each byte in WORK, look up its position in OFFSETS and update WORK to be the value found there. So if WORK is 'A' (193 in EBCDIC), find the value at OFFSETS, which we could arrange to be 0, and then update WORK to be that value. The effect of this is to create a block of memory 256 bytes long with values 0, 1, 2, ..., 255. The next line uses ORG to set the location counter to OFFSETS+C'A', ie the position where A would be in the EBCDIC table. We then overwrite a part of the 256 byte block with the bytes 00, 01, 02, ..., 09, creating the offset to replace letters A - I with. We do this again for the letter run starting with J and S.
We do this contiguously three times to allow for forward and reverse rotations with the key, so FLAT+1 gives us B and FLAT-1 gives us Z. Doing it this way allows easy access; we could just use one block of letters and deal with rotated offsets past the ends with extra logic, but I don't mind giving up memory for ease of access here. This will set register 4 to the value in memory at the byte addressed by WORK + 1. To store a character back into memory, STC can be used in a similar way. C     4,MAXOFF           Is it an offset? We use a predefined area of memory WORK to do the transformation rather than passing in an address, again just for convenience. Note the explicit use of addressing in IC 4,0(4,10). The second parameter means use register 10 as the base address and add the contents of register 4 to the displacement 0. One other observation is that the BXLE loop is only needed as we want to skip over non-alphabetic characters in the message. If we knew the message can only contain A-Z, we could do something like TR WORK,FLAT+KEY to do the whole message in one go. THE FIVE BOXING WIZARDS JUMP QUICKLY! AOL MPCL IVEPUN DPGHYKZ QBTW XBPJRSF! I think that was the hardest program to write of all the languages so far. The documentation is very good, but terse - I can imagine reading the Principle of Operation several times would pay off greatly. Also having to flip between Principles, the Assembler F reference and MTS documentation rather than having everything in one place was tough. But it was very rewarding to get the program running. I'm not entirely happy with the final design I came up with - I'm sure there's an easier or more efficient way. I'd love to hear from experience System/360 assembly language programmers out there how you'd implement this. Full source code for this program can be found on github. In the previous post we got a simple assembly language program running. Let's now look in more detail at how to program in System/360 assembly language. Although a lot of this material is common across other System/360 operating systems and assemblers, it does contain specifics for MTS and Assembler G.
This only covers the surface of the subject: see the end of this post for some of what was missed and how to find more information. 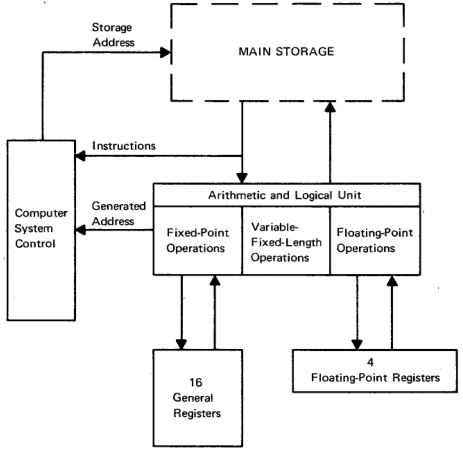 The IBM System/360 and its derivatives has the following basic architecture. 32 bit words, with access to 16 bit halfwords and 8 bit bytes. Big-endian, using 2's compliment for signed values. 16 general purpose 32 bit registers, 4 64 bit floating point registers, plus support for BCD arithmetic. A 64 bit program status word (PSW), which contains the address of the current instruction being executed, condition codes and interrupt masks. Most System/360 models did not support virtual memory, but the one used for MTS did. An optional label, which must start in column 1 if present. An opcode, assembler directive or macro indicating the operation to perform. An optional set of operands separated by commas. An optional identification sequence, in columns 73-80, commonly used to number each statement. Apart from the first and last element, which columns are used is not important, but by convention they are lined up. Let's look at lines from the 'Hello, world' example from the last post to illustrate these features. This line loads registers 12 with the contents of register 15. The next line loads register 3 with the value found at the address with label RUNS. Looking at the line labeled RUNS, we can see the value pointed to defined as a constant using the assembler directive DC. Constants of different types are represented with quotes, so F'5' means a fullword (32 bit quantity) with a value of 5. X'BEEF0' would be a 20 bit value composed of the 5 hex digits BEEF0 each taking up 4 bits. DC stands for data constant, and arranges a value to be placed at a location in memory after the previous line. DS can be used to arrange data storage, allowing the program to write values back to memory. Next let's see how the assembler constructs machine instructions from parts of this program. The listing sent to sprint when running the assembler contains a dump of memory locations and assembled code for each line. For example, here's the line where the RUNS constant is stored (I've omitted some columns from the listing for clarity). Here we can see the fullword quantity 5 being stored at address 3c. Opcodes on System/360 are a single byte: here 58 is the opcode for L, load. The next four bits, 3, represents the register to load into. The next four bits, C, is the base register. The final 12 bits, 03C, is the displacement. The address to load from is base register + index register + displacement. In this example, the index register is 0 which indicates it is not being used, so at run time the system will find the value at offset 3c from whatever is in the base register. The base register is present in nearly all addressing operations and ensures that System/360 is relocatable: at run time, the start of this piece of code is loaded into memory somewhere and a register is set to that address so all further address arithmetic can use it. Here, START 0 means the program will be placed at offset 0 in the block of memory being composed. USING HELLO,12 states that register 12 (C) will be the base register. Finally, LR 12,15 loads register 12 with the contents of register 15: this is part of the calling convention for MTS, so when the program starts it knows it can find its own start address in register 15. Using USING allows the assembler to take care of the base register for you, but you can also specify it and the index register directly. This sequence of opcode and operands is called RX format. Other opcodes use other formats; for example, the LR 12,15 is in RR format, where the one byte opcode is followed by two 4 bit register operands. Other formats can take an immediate value and an address, or two addresses. We've seen L and LR already. LH loads a halfword (16 bit) quantity from the given address, sign extending it to a fullword. LTR will load a value and set condition codes, which will look at in the next section. LCR will load a value and toggle the sign; LPR and LNR will load and force positive or negative. will load up the registers R3, R4 and R5 with data from the memory address in base register 12 + 0 offset, reading 3 fullword values in sequence. For stores, we have ST for store fullword quantity in a register to memory, STH for storing a halfword and SM for storing multiple registers to a sequence in memory. Addition opcodes are A and AR for add memory to register and add register to register. AH to add halfwords and AL/ALR to add ignoring the sign bit. Subtraction is orthogonal. will multiply the value of register 2 and the value found at LABEL, then store the results in registers 2 and 3. The PSW, or program status word, is a doubleword that defines the current state of the processor. It includes fields that indicate interrupt masks, state (eg problem state), condition codes and the current instruction address. The condition code is set after many operations, for example add, subtract or load and test. The branch on condition opcode can be used to branch based on its value. This comes in two formats, a RR instruction BCR where if the branch is made, the address is taken from one register, or BC which uses the base+index+displacement system. Whether to take the branch or not is determine by a four bit mask. A mask value of 8 means branch if condition code 00 is set, mask value 4 for 01 etc. These can be added together, so a mask value of 12 means branch on either condition code 00 or 01 (zero or negative). If all four mask bits are set, the branch is unconditional, if unset, then the instruction is a no-op. BP stands for branch if positive, and will test the condition code from the previous S subtract: if the value is positive, then jump to address labeled as LOOP. Internally, the assembler turns BP LOOP into BC 2,LOOP(0,12), using mask 2 = condition code 10 and if positive branching to the address given by the base register 12 + LOOP. BXLE stands for branch on index low or equal. In this example, register 1 is incremented by the value of register 2. If register 1 is less than equal to the value in register 3, then the branch is taken. Supporting subroutines or functions requires a facility to pass in parameters, jump to the called code, do an operation, and return to the calling code with any results. On most modern systems this is done via a stack, but you may have noticed this was not part of the architecture overview above, so how is this done? The answer is that a combination of a save area in memory is used to store data plus a calling convention so the caller and callee can exchange information via registers. The actual change in location address is done by a branch when this is set up. The calling convention used is up to the programmer, but in practice IBM defines a standard calling convention so that code in different languages can operate together. Register 1 points to an address where a list of parameters for the called program is stored..
Register 13 points to a save area, described below. Register 14 points to the next instruction in the calling program that the called program should return to after execution is done. Register 15 points to the entry point of the called program. The save area is a portion of memory with a specific format, owned by the calling program where the called program can save registers and other data. For example, word 6 is used to store the contents of register 0. It is the responsibility of the called program to save data in the save area and restore it before returning execution to the caller. A byproduct of this is that recursion is not freely available like on stack based architectures, as there is a single save area per program call, multiple calls would overwrite this area. Special code is needed to dynamically allocate save areas if recursion is required. EXIT to restore saved values and pass back a result code. Register 15 is loaded with the address of the SYSTEM subroutine (which is determined at link time) and an unconditional branch is made. The L sets up the subroutine address in register 15. A parameter list is defined with the DCs; the BAL puts the address of this in register 1 and jumps over the constants.. Finally, BALR is used to jump to the address stored in register 15, storing the current address (and other bits from the PSW) in register 14. Other parts of the PSW and their use in system programs. See the end of the last post for links to documentation to find out more about assembly language. In the next post we'll write a complete program in assembly. After the heights of APL, let's turn to the lowest level language possible: System/360 assembly language. MTS runs on the IBM System/360, designed from scratch by IBM in the early 1960s as a unified successor to a number of different architectures. System programmers, and application programmers looking for maximum performance used assembler to write code as close to the bare metal as possible. As the System/360 was a new design, the architecture is clean and fairly simple. It's a 32 bit architecture with 24 bit addresses, 16 full word registers and 4 64 bit floating point registers. Binary Coded Decimal (BCD) arithmetic and I/O operations are also supported. MTS ran originally on a System/360-67, and later on 370 and Amdahl CPUs which provided extensions to the basic instruction set that we will not consider here. The main assembler available to us today is Assembler G (*ASMG). This is a basic assembler, derived from Assembler F provided by IBM for OS/360 with extensions by the University of Waterloo for improved performance. At the time of MTS D6, the most common assembler in use was Assembler H. This has a considerable number of improvements to the assembly language supported in Assembler G; however, this is not available in the MTS distribution due to copyright reasons. 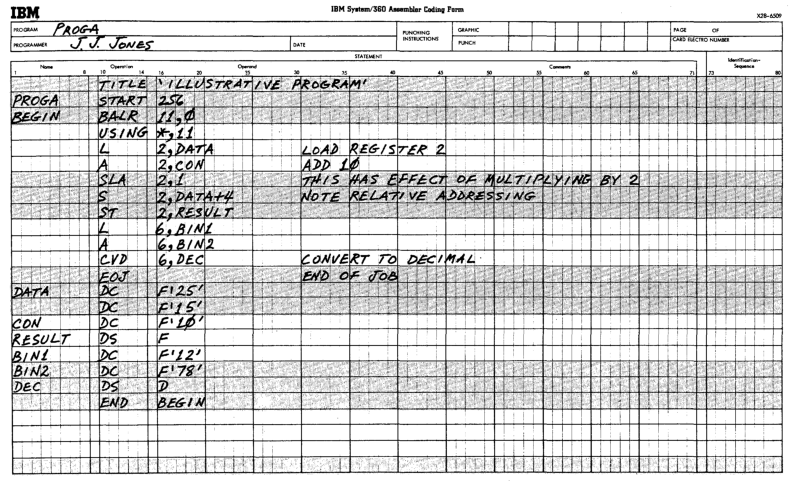 ASSIST, Assembler System for Student Instruction & Systems Teaching, was an assembler and emulator used by students to learn assembly. As it emulates the underlying machine it can provide additional debug information and run time control, at the expense of performance. It is available on the MTS distribution as *ASSIST. Finally, *ASMT is a specialised assembler compatible with features on IBM's time sharing system TSS. We will not consider either of these further in these blog posts. *ASMG will take a file of assembly language instructions from scards and write output to spunch. A program listing can be sent to sprint and errors to sercom if these are set on the command line. Extra parameters can be set with par, for example par=test will add debugging information to the object file. Linking is done at run time by MTS, so if you are just using the system libraries the object file can be run directly with $run. Let's see how to run a simple program to print 'Hello, world!' five times using assembly language. Here's how to run the assembler. We send errors to *sink* so they are displayed immediately and a full program listing to -hello.l.
. *** library instead of *SYSMAC. It will no longer work with *SYSMAC. We can ignore the *ASMG has been changed... message; NO STATEMENTS FLAGGED means that it worked OK. Finally, let's run the assembled program. A good place to start is A Programmer's Introduction to IBM System/360 Assembler Language, which gives an overview of the System/360 architecture and then teaches different aspects of assembly language programming using examples. A full description of how the System/360 works and the opcodes available is in IBM System/360 Principles of Operation. OS Assembler Language is a reference guide to assembly language. *ASMG is documented in MTS Volume 2X from page 27 onwards. MTS Volume 14: 360/370 Assemblers in MTS details the differences between Assembler G and Assembler H, macro libraries, structured programming macros and the ASSIST assembler. MTS Volume 3: System Subroutine Descriptions describes the 'standard library' of routines available to assembler programmers on MTS. In the final part of this series, let's create a real program in APL. As before, we'll show both the original and transliterated version so we can run the program on MTS's APL. 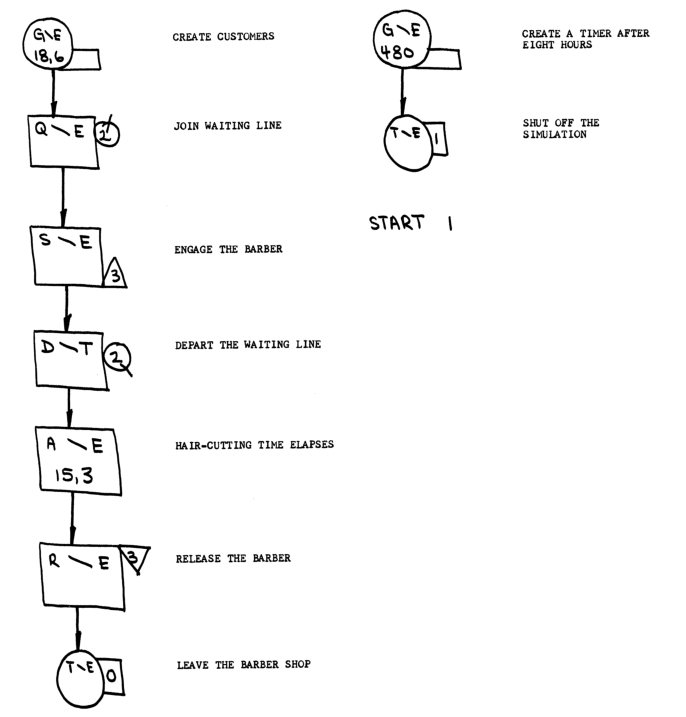 We'll implement Knuth Shuffle (also known as Fisher/Yates shuffle) from Rosetta Code. This produces a random permutation of a vector. Dyadic ?, or deal, looks an ideal candidate here. Recall from the previous part that x ? y means take x unique items from the population 1 ... y. This means that x ? x will give a random permutation of all the values 1 ... x, which we can use as vector indices. We'll need to define a monadic function that takes the vector to be shuffled as input and returns a new, shuffled vector. We need to know the length of the vector, for which we can use rho (⍴ or $RH). We need to access a series of vector contents by their index, which we can do with [ ... ]. In the last example we need to use ravel (,) to change the input scalar 11 into a vector of length 1 containing 11. What language features will we need from APL? The temporary variables i and j mean we will need to declare local variables in our function. Looping can be done by a sequence of instructions with the branch operator (→ or $GO) testing whether we have reached the start of the vector or not. By default, APL vectors are indexed from 1 ... length so we'll need to account for that in the loop. The algorithm needs a random number to determine what to shuffle, for which we can use the monadic form of ?. We need to swap two elements of the vector. I thought this might need a separate function at first that uses a temporary to swap, but after some review of how indexing works in APL I realised we can use v[x,y] = v[y,x] to swap elements at x and y. Line 2 is tricky: it branches to lines in the vector in round brackets based on the expression in the square brackets. If I is less than or equal to 1 then the expression evaluates to 2, so control jumps to line 7 (S ← V) where the output value is assigned and the function ends. Otherwise it will continue to line 3 and swap an element. Running this on some test cases shows this works as expected. Ideally we'd like to use idiomatic APL and avoid a loop altogether. Modern APLs have control structures like repeat, but I can't see an easy way to do this in APL\360 - if you can, please add a comment! On my system, SHUFFLE1 takes 7.3s to run and SHUFFLE2 24.6s, which we'd expect as SHUFFLE1 uses the system provided deal function. I also ran a quick check for randomness by printing the results to a file and seeing how many times each permutation occurred. Over 60,000 runs we'd expect each permutation to appear around 10,000 times; SHUFFLE1 was within 0.5% of that and SHUFFLE2 0.6%. Internally, ? uses a pseudo-random number generator so true randomness cannot be achieved. Also with a 32 bit word, the number of possible states is 2^32, which limits the number of combinations that can occur. For example, if we wanted to shuffle a deck of 52 cards there are 52! combinations, much more than 2^32. APL's use of a large number of symbols is what first strikes you when learning the language. I found by going through the tutorials that you start picking them up quite quickly, and it's not hard to write simple programs. However, reading other people's programs can be difficult, given its compact form and right-to-left structure; I imagine that understanding a large APL code base would take some time. The language itself is unique and even beautiful; some times I feel like I'm writing mathematics rather than coding. If you have the opportunity then I'd recommend trying it out. The transliterations needed on emulated MTS add another level of difficulty and unless you want to experience the historical aspects of running APL like this I'd recommend learning APL with a modern implementation that can use APL symbols directly. There are several commercial implementations that run on modern hardware, for example Dynalog. The GNU project also has GNU APL. Several languages have been derived from APL, including K, used for financial analysis. Jeff Atwood's Coding Horror blog has a good post on shuffling with a follow-up on the dangers of mis-implementing the algorithm. Eugene McDonnell wrote an interesting article on How the Roll Function Works in APL\360 and other APLs, giving insight on its implementation. To see some amazing APL one-liners in action, check out Sixteen APL Amuse-Bouches. After the introduction to APL in the last post, let's now look in more detail on how APL works. As the emulated system dows not support entry and display of APL symbols, we will have to use transliterations, eg * for the multiply symbol ×. The code samples below show the original version on the left and the transliterated version on the right. An appendix at the end of this post lists all symbols used and their transliterations. Similar to the last language we looked at, PIL, when APL starts up it allows you to enter expressions and get results immediately. The prompt is eight leading spaces and results are printed in the first column. We can enter simple arithmetic functions and get results as expected. Plus and minus work as expected; note that negative numbers are displayed with a leading underscore to represent the − symbol. Multiply and divide give more interesting results. Multiply gives the signum of its parameter: -1 if negative, 0 if zero or 1 if positive. Divide gives the reciprocal of its parameter. The modulus operator (∣ or $|) works the opposite way around from what you may be used to from other languages, so 10 ∣ 12 is 2. Values can be assigned to a variable with ← (=). Variable names need to start with a letter. Underlined letters can also be used; these are transliterated to lower case letters. As well as single numbers, you can have vectors of numbers. These are entered by separating the elements with spaces. Operators work on vectors as well. If the dimension of the parameters differ, APL will extend the shorter vector as appropriate - so 1 2 3 × 2 will give 2 4 6. Strings are introduced using quotes; internally APL treats them as vectors of characters. Booleans are represented as numbers with a value of 0 or 1. These are returned by comparison functions like equal, greater or equal (=, ≥ or =, $GE). Logical operators like and (∧ or &) can operate on these. The rho function (⍴ or $,) gives the dimension of a vector when used moadically. Used dyadically, it can create a matrix from a vector on its right side by giving the shape on the left side. Comma (,) used dyadically is called catenate, and adds to a vector. A vector of length 1 looks like a scalar when displayed. We can tell them apart with double rho, which gives the rank. Iota (⍳, which can be transliterated as any of $IO, $IN or $.) creates a sequence when used monadically and gives index positions when used dyadically. Square brackets can be used to extract elements based on index positions. There are over 50 APL functions so it would be difficult to go through them all here, but let's take a brief tour to show some of them in action. Grade up (⍋ or $GU) gives sorted indices, with grade down doing sort in reversed order.
? used monadically is known as roll, producing a random number between 1 and the right hand argument. Used dyadically, it is known as deal: x ? y means take x unique items at random from the population 1 .. y.
Decode (⊥ or $DE, $BA) converts bases. Encode (⊤ or $EN, $RP) goes the other way. Below we show 2 hours 30 minutes decoded into number of minutes and then re-encoded. Why does it return -2? This is due to the right to left associativity of APL: we coild expand this as 1 - (2 - (3 - 4)). Apart from the parameters, any variables used in defined functions will be global by default. To set up local variables, add a semicolon and the variable names on the function definition line. After defining a function, you can list its contents by entering del, the function name, quad (⎕ or #) in square brackets then del, all on the same line. To delete an entire function you need to use the erase system command with the function name, eg )ERASE FOO. System commands, starting with ), manipulate the APL environment. )OFF will quit APL, )FNS and )VARS will list currently defined functions and variables respectively. To manage sets of functions and variables, APL has the concept of workspaces. The current set can be saved to a named workspace, eg FOO by the user with the command )SAVE FOO and then loaded later with )LOAD FOO. APL will also automatically save the current set to the workspace CONTINUE on exit and load it again at startup. To wipe out the current running set, use )CLEAR; to delete from disk user )DROP ws. There are also system workspaces, organised into libraries identified by numbers. Use )LIB n to see the workspaces in library n and then )LOAD n ws to load a names workspace. For example, let's look at the workspace APLCOURSE in library 1. This defines a function DESCRIBE which explains its contents. LENGTH ZERO OR ONE ARE EXCLUDED. Workspace 6 contains a resource management game called KINGDOM. In the next post we'll look at implementing a real program in APL. This post has only scratched the surface of APL. See the Further Information section in the APL introduction post for more resources to learn about APL. This is a copy of the table UM Computing Center Memo 382, excluding characters that are marked as not in use. Deal / random ? ? Iota ⍳ $IO $IN $.